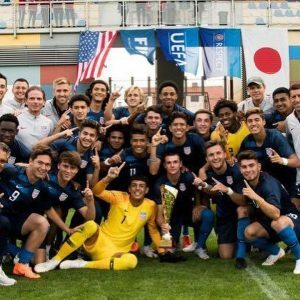 As the tournament started, the U-18 MNT was drawn into a group with UAE, Bulgaria and the Czech Republic. The first game was against a tough UAE team, but the U.S. was able to come away with a 2-1 victory. This gave the U.S. momentum as they went into their next game versus Bulgaria. The team scored three goals in the first half of the game and ended up winning with a score of 5-0. This set the U.S. up for their game against the home Czech team. After a grueling 90 minutes, the match ended 1-1, which allowed the U.S. to advance to the final game against Japan. This game also ended with a 1-1 score and went straight to a penalty shootout. Fortunately the U-18 MNT came away victorious, bringing home the trophy for the third time in six years. The entire trip was a fantastic experience. As an Athletic Trainer for Athletico, I have been able to work with world-class staff and athletes. I look forward to the next experience. Click here to read about other Athletico experiences with U.S. Soccer.